Avoiding the dreaded “Trout Pout” – your guide to Natural, Youthful Lips. We have all seen the unnatural and feared Trout Pouts and Duck Lips that are unfortunately becoming more common as demand for fuller lips increases. I want to share a few principles that I abide by to create natural, youthful (and subtle) improvement in lip volume and appearance. When looking at the lips, the upper lip should be about 1/3 of the total lip size and the lower lip about 2/3. This trend seems to fluctuate somewhat – these days people are wanting larger upper lips. To achieve natural appearing lips, the upper lip should never be larger than the lower lip. As we age and skin loses elasticity, the upper lip lengthens which causes less of the red lip to show. 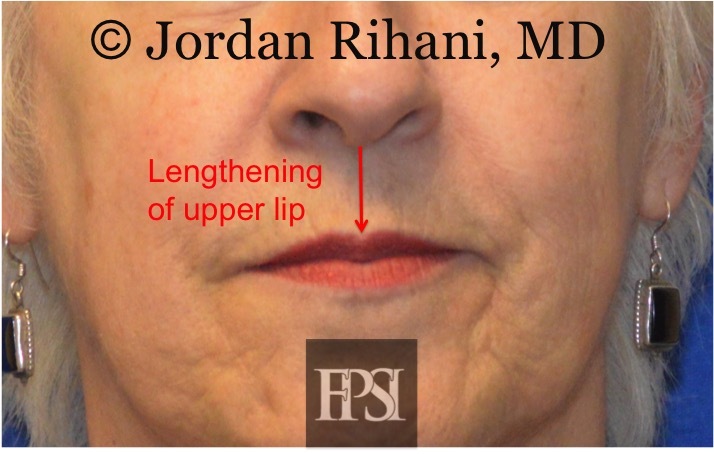 There are some simple injection techniques that can allow the upper lip to look shorter, but injections if done incorrectly cause cause worsening of this lengthening because there is too much volume in the upper lip. Lip shortening procedures are also used to lift the red lip to a more youthful position. A subtle feature, although very important, is the Cupid’s Bow of the upper lip. Flattening of the Cupid’s Bow occurs with aging as the lip lengthens. Injection techniques can be used to improve the appearance of the Cupid’s Bow as well as improve volume of the philtral columns – both features of a youthful upper lip. These vertical lines do not just occur in smokers. As patients lose volume in the tissues of the lips, these vertical wrinkles, also known as lipstick lines, occur. I use a combination of Botox as well as fillers to allow normal movement of the upper lip while providing improvement in these pesky lines. What you need to know before your lip injections. Which fillers do I offer? I am currently injecting hyaluronic acid fillers for improvement in lip volume (eg. Juvederm Ultra and Restylane Silk). I also offer collagen and fat for more permanent volume improvement. See my Lip Augmentation page for more information. What is the cost and expected down time? Depending on which filler is used, most fillers start around $500-600 and go up in price from there. Expect some light bruising. Improvement in lip volume will be evident right away. There is some swelling for a couple of days which decreases over that first week. In general hyaluronic acid fillers (Juvederm, Restylane) last about 6-12 months. Collagen and fat are more permanent options that can provide improvement for up to 10 years or more, but results may vary. For more information see our informational video below.